Fifty years ago almost everyone in Wales lived in sight and sound of steam trains, which were part of the fabric of everyday life. But in the early 1960s, chairman of British Railways Dr Richard Beeching's plans for modernisation and efficiency closed hundreds of branch lines, stations and tunnels. Steam power was scrapped in favour of diesel. In 1975, eight years after the last steam engine ran on British Rail, a group of enthusiasts started the Llangollen Railway. Other enthusiasts, like amateur cameraman Jim Clemens, kept the spirit of steam alive by filming branch lines before they closed. 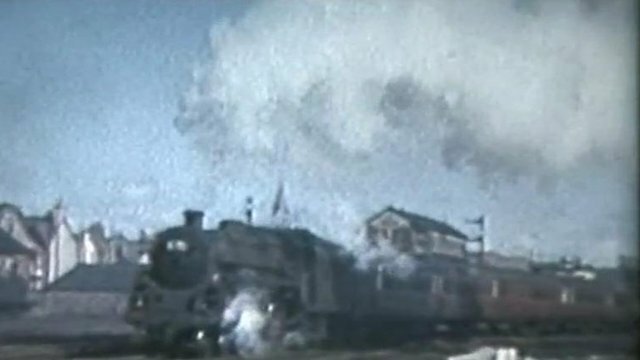 Much of this rare footage, never before seen on television, is featured in a new two-part BBC Wales series offering a glimpse into the heyday of steam in Wales. In this extract, Jenny Griffiths recalls trips to Rhyl and Barmouth from her childhood home in north Wales. The first episode of Beating Beeching: A Passion For Steam is on BBC Two Wales on Tuesday, 6 December at 19:30 GMT.